Industrial Robotics Market size was valued at over USD 35 billion with a global shipment of over 290 thousand units in 2016. The high costs of employing manual labor and the inconveniences associated with providing benefits such as promotions, health and safety compensation and insurances, benefit packages, increasing wages on a yearly basis, and paid leaves is a major factor leading to the movement towards the adoption of automation technology, therefore driving the industrial robotics market. Furthermore, the costs of employing and training workers and their replacements is very high. In account of the intangible benefits, workers cannot function in harsh or inhospitable environments and have lower satisfaction in carrying out repetitive tasks as opposed to robots which have far lower restrictions. In countries of North America and Europe, the costs of employing manual labor are experiencing a substantial growth, which is offering huge growth opportunities for market. For instance, the labor costs in the European area comprising of the 28-member countries experienced a 2.2% growth. As the technology is subject to continuous changes and advancements, the regulatory framework is highly complex and constantly updated or modified to accommodate new improvements. A major area of concern in the industrial robotics market is the safety of the operators, primarily in collaborative robots which work alongside human personnel. Various countries such as China and Japan have very lax robot laws and are just beginning to regulate the production and design of these equipment, which is anticipated to fuel the market size. These robots provide a high positive ROI to business owners and manufacturers which is dispersed over a long duration escalating industrial robotics market demand. The initial costs of purchasing these equipment is very high and can be particularly expensive to businesses that buy these equipment in bulk as opposed to a single-time or replacement purchase. Furthermore, these prices are followed by initial personnel training and installation costs and recurring costs for maintenance and cleaning. When looking at the prices of these systems, add-on peripherals such as end-of-arm tooling (EOAT), controllers, teach pendants, and programmed software causing the total system costs to increase drastically. Such high rates are highly unfeasible to players having a very limited financial budget. The articulated robot segment holds majority share in the industrial robotics market owing to their high multi-purpose applications such as assembling, palletizing, welding, painting, and more. These systems have a flexible movement as they are not limited to movement along a corresponding coordinate axis allowing them to be utilized conducting very complex tasks as opposed to the other robotic systems. 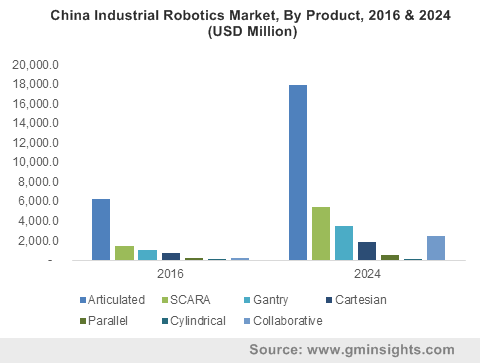 The collaborative industrial robotics market segment is anticipated to exhibit a high growth at a CAGR of over 25% over the forecast timeframe. Industry players integrate these systems with sensors and cameras that can track human movement and stop or alter their motion path to avoid accidents and injuries. Furthermore, these systems are priced comparatively lower than traditional systems and work in collaboration with human personnel, reducing human idle time and complete tasks which require human intervention at a much faster rate. The demand for cylindrical robots in the market is anticipated to deteriorate during the forecast timespan owing to their small work envelope, and limited movements and applications. Despite their low pricing, these systems are being increasingly replaced by other robotic systems such as SCARA and articulated that can be used for a larger number of applications. The automotive sector is a significant customer in the industrial robotics market as these massively aid in increasing the work output as compared to manual labor. Changing trends such as the development of energy efficient drive systems and electric vehicles is further causing consumers to replace their existing vehicles with modernized vehicles. Also, there is a high rate of competition amongst market players causing them to seek automation to meet the consumer demand. Companies in the industrial robotics market are focusing their efforts onto other sectors such as pharmaceuticals and food & beverages where quality and precision of the ingredients/products plays a major role. For instance, KUKA AG’s palletizing robots are used by Corona Beer for stacking crates. Robotic applications in pharmaceutical sector, for instance, has the added benefit of being able to work in sterile environments without the potential for contamination from human or the environment during component transfer. The steady increase in labor wages in the U.S. UK and Germany and increasing adoption of advanced technologies such as collaborative, cloud-base robots, and AI integrated technologies is contributing towards the high industrial robotics market growth. Also, owing to the rising focus on the safety of workers in countries such as the U.S., the operations that involve dangerous tasks such as high-temperature welding is assigned to robotic systems. Presence of government initiatives promoting the adoption of these systems driving the industrial robotics market in the Asia Pacific region. Various economies in the region such as China, India, Malaysia, and Japan are providing grants to regional players. The Japanese government, for instance, has funded and developed a new robotic strategy that supports SMEs to engage and enable new advance manufacturing capabilities. Furthermore, the region has a low and constantly declining working-class population which comprises 60% of the general population. In such a case, industrial robots are highly beneficial in boosting production output and meeting the global and regional demand. Companies in the industrial robotics market include Denso Corporation, Fanuc Corporation, Kawasaki Heavy Industries Ltd., KUKA AG, Yamaha Motor Co., Ltd., Mitsubishi Electric Corporation, etc. Companies operating in the market are investing heavily in creating compact, light-weight robotic designs. These aid manufacturers to boost production times as they are designed to improve the speeds. Design compactness allows developers to provide lower overall costs of the robots by swapping heavy materials such as iron used in the robot body with lighter-weight materials such as aluminum and composites. In November 2017, Denso Wave Incorporated announced the launch of its collaborative robot Cobotta, that is compact and user friendly. The company launched the product with an aim to expand its product portfolio. With the advent of Industrial 4.0, companies operating in the industrial robotics market are evolving their business models continuously. The industry is focusing on developing partnerships with major IOT companies such as Huawei Cisco and Microsoft. 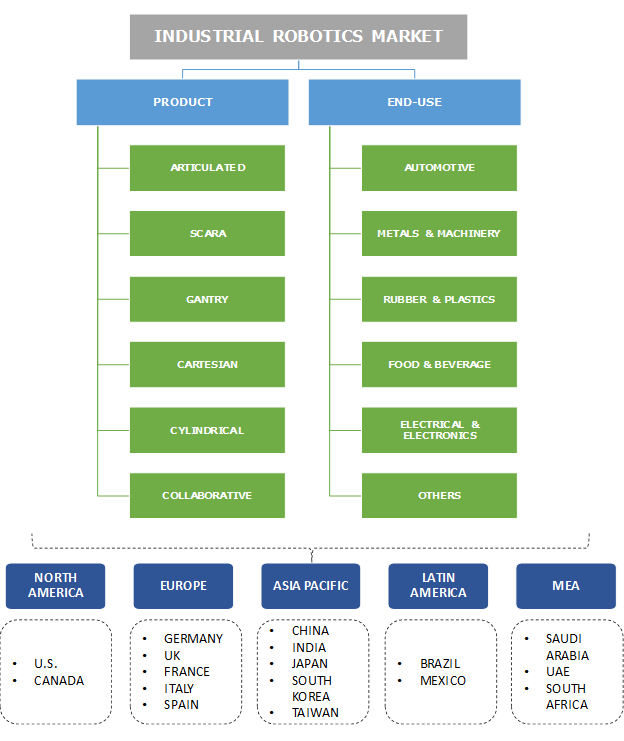 Partnerships such as these allow businesses to develop new and advanced technologies that an industrial robotics manufacturer may not have the needed expertise of. In April 2016, Fanuc Corporation announced that it was entering into a collaboration agreement with Rockwell Automation, Cisco and Preferred Networks to develop and install the FANUC Intelligent Edge Link and Drive (FIELD) system. Human labor is a major substitute in the industrial robotics market. This is highly amplified in countries of South-East Asia where labor is available at very low costs. The rising prominence of collaborative robots is anticipated to tackle this issue as these systems work in collaboration with humans, leading to high productivity and lower retaliation from a company’s manual workforce.